Derby and Prix de l'Arc de Triomphe winner Golden Horn has been named Cartier Horse of the Year for 2015. The three-year-old, trained by John Gosden, also claimed the Eclipse and Irish Champion Stakes this year. The colt, second in the Breeders' Cup Turf under Frankie Dettori on 31 October, has now been retired to stud. 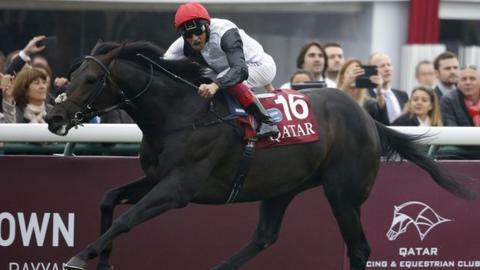 A win would have seen Golden Horn become the first horse to win the Derby, Prix de l'Arc de Triomphe and Breeders' Cup Turf in the same year. Found - for trainer Aidan O'Brien - proved too strong for Anthony Oppenheimer-owned Golden Horn in Kentucky. Former Horse of the Year winners include Frankel, who triumphed twice, Sea the Stars and Hurricane Run. In the 25th year of the big racing awards, a special presentation was made to Jack Berry, a tireless fundraiser for injured jockeys. The rehabilitation centre, Jack Berry House, was opened in Yorkshire earlier in 2015 in honour of the 78-year-old former rider and trainer. As well as Golden Horn, other equine stars honoured at the awards included top older horse Solow, and leading sprinter Muhaarar.